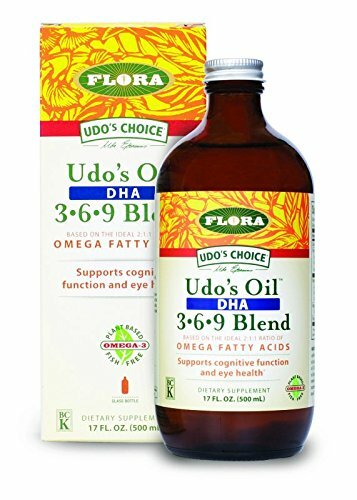 Udo's Dha Oil Blend Is An Excellent Vegetarian Source Of Dha (Docosahexaenoic Acid) (Algae-Derived). Dha Is An Omega-3 Fatty Acid That Is Essential For The Proper Functioning Of Our Brains As Adults, And For The Development Of Our Nervous System And Visual Abilities During The First Six Months Of Life. * Supportive But Not Conclusive Research Shows That Consumption Of Epa And Dha Omega-3 Fatty Acids May Help Reduce The Risk Of Coronary Heart Disease. Unique Company Features: At Flora, We Have Been Manufacturing And Supplying Quality Herbal Remedies For Distribution In The United States Since 1988, But Our Roots Stretch Back To Germany In The Early 1900's, Where Dr. Otto Greither, Grandfather Of The Current Owner Thomas Greither, Dedicated His Life To The Discovery, Production And Distribution Of Natural Health Care Products. We Have Preserved His Original Dedication To Perfect European Herbal Remedies That Ensure Maximum Purity, Quality And Potency. Product Specifications: 17 Oz. If you have any questions about this product by UDOs Choice, contact us by completing and submitting the form below. If you are looking for a specif part number, please include it with your message.